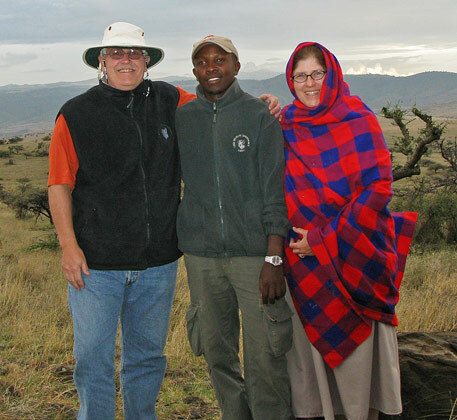 During our first trip to Africa, my husband Scott and I learned that while we were each limited to 40 lbs (18.14 kgs) of luggage on our safari, the airline had an allowance of 100 lbs (45 kgs) of checked luggage plus a 40-lb (18.14 kg) carry-on. In making plans for a second trip, we looked into visiting a school, Mabele Primary School, near our accommodations in Botswana. We contacted our safari company, Wilderness Safaris, to see if we could determine any specific needs of that school. Armed with that information, we were able to deliver 140 lbs (64 kgs) of school supplies, including soccer balls, to the school. It was enormously rewarding to be able to help the people in the community that had given us such a life-changing experience. Since then, we and a few of our fellow travelers have made several trips to other countries in Africa and have been able to deliver an estimated 1,000 lbs (453 kgs) in donations of clothing, school supplies and medical supplies. I asked our travel agent why other travelers did not use their luggage allowances this way. ”Because nobody thinks about it,” he said. That was our “aha” moment. Scott and I knew from our experiences that taking large amounts of supplies required a great deal of time and close, logistical cooperation with the touring company. We felt we needed to come up with a simpler and more direct way for travelers to take supplies where they were going. By asking travelers to pack 5 lbs (2.27 kgs) of supplies, we felt we would be able to involve everyone who wanted to add value to his or her trip by participating. By delivering the supplies directly to the traveler’s accommodation, it would be possible for every traveler to contribute and require no logistical support. That amount would take only a small space, require little effort and still make a big impact.